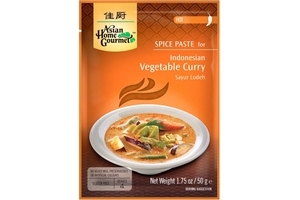 Asian Home Gourmet Indonesian Vegetable Curry Seasoning - Sayur Lodeh in 1.75oz (50g) sachet. Using Only High Quality Fresh Herbs & Spices and No Added MSG, Preservatives or Artificial Flavor. Sayur Lodeh Means a Variety Of Vegetables In Coconut Gravy. It Is Traditionally Served With Rice and Is a Most Appealing Dish To Vegetarians. Vegetarian Society Certified. Product of Singapore. International Shipping Rates for Bulk Buys®. oil, onion, galangal, garlic, salt, shallot, sugar, ginger, lemongrass, ground turmeric, natural herb and spices.